Happy New Year! Geeks in Modesto and the surrounding area know all too well of the drought after the holidays, where it seems like there’s nothing to do or look forward to in the near future. But if you can make it up north to our state capitol, you’ll find an event that will kick off your new year just right. 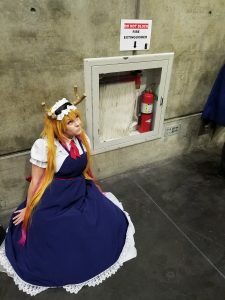 SacAnime is a convention typically held at the Sacramento Convention Center, just across from the Sheraton Grand Hotel and celebrates both the art form of anime and the community that surrounds it. Anime, for those of you unfamiliar, is the Japanese term for “animation” and typically means animation that originates from Japan. There’s countless examples, but popular titles in the west include “Sailor Moon”, “One Punch Man”, “Speed Racer”, and “My Hero Academia”. 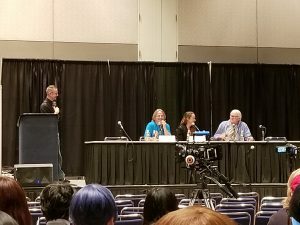 SacAnime’s Super Mario voice actor panel, featuring (from left to right) Kenny James, Samantha Kelly, and Charles Martinet. And if you love anime, then SacAnime is the place to be. The three-day event is packed with panels discussing popular titles and current trends, cosplay contests, and meet-and-greets with the voice actors who bring beloved characters to life. The cosplay in particular is noteworthy, because cosplayers were out in full force as I roamed the halls of the convention center. Name a popular anime title, and there was guaranteed to be someone representing it and getting tons of photo requests or compliments from attendees and fellow cosplayers alike. But even if anime isn’t particularly your thing, there’s still so much to do. The event was particularly noteworthy in that it featured Charles Martinet, Samantha Kelly, and Kenny James as special guests, the first time all three have appeared at the same event. Not familiar? You may know them better as the voices of the Mario Bros.’ Princess Peach, and Bowser from the “Super Mario” series of video games. And don’t go thinking the cosplay scene was all anime-themed, either. Super heroes, Star Wars, video games, it seems like virtually every form of pop culture had cosplay representation. 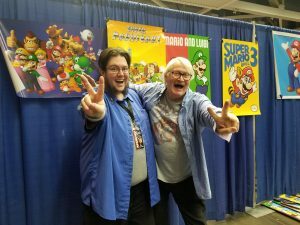 Charles Martinet (right), voice actor for the Super Mario Bros. and other video game characters. That said, in this reporter’s opinion, the main attraction of SacAnime is the exhibitor’s hall. If you’ve been to a convention, this needs no explanation. But for those curious, the exhibitor’s hall is where you’ll find the vendors, galleries, and Artist’s Alley, a staple of most conventions where independent artists can promote and sell their works. These can range from art prints, jewelry, handcrafted plush toys, enamel pins, and so much more. And in chatting with the artists I came across, I found that more than a few hailed from Modesto, Turlock, and Ceres. If all of this sounds great except for waiting another year to attend, I have good news: SacAnime is held twice a year, and you’ll find the next one on June 7th-9th at the Sacramento Convention Center. It may not be what some consider “local”, but I found that SacAnime is well worth the trip.